These anti-gun, anti-constitution Political Hacks need to feel the heat ! Thanks for spreading the word! We still need to deal with the library situation. I recall that libraries were exempted from the requirement to have metal detectors. I had called KAT about a year ago and asked if guns were prohibited on buses. The Safety Officer said yes. Since I couldn't afford to gain standing by purposefully going armed while open carrying on a bus, in order to then file suite, this certainly is welcome news for the less fortunate who were most affected by this. 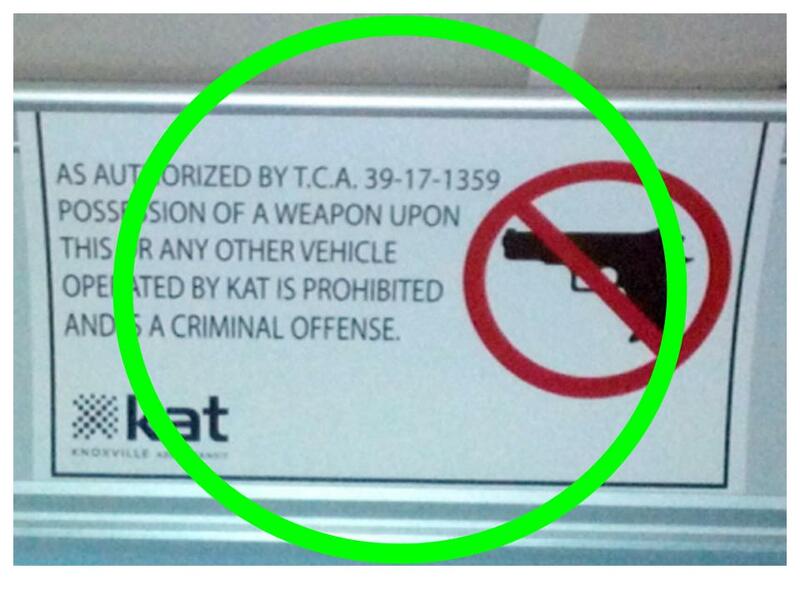 Fred, now that folks can carry on a KAT bus, it would be nice if they had a range that the bus actually goes by. But...Knoxville bans ranges within the city liimits. Still a lot of "gun free" zones that have to be addressed and that stupid law that makes you a bad guy if you pass into a PUBLIC BUSINESS that has a Second Amendment killing sign on the door.